I finished my hoopskirt! It actually turned out to be a super easy project. I don't know why I haven't made more hoops in the past! (cage crinolines aside, of course) I'm hoping to be able to try everything on tomorrow, since I'd rather try it on before I put the waist hooks/bars in, and I also still have the one button to repaint on the boots. And have to figure out the reticule/purse/pocket option. I was also gifted an (I think) early 1890s silk suit by one of my classmates today, since it was given to her and she didn't know what to do with it. It's relatively plain, but has some really interesting features (like pockets!). I'll hopefully get some pictures of it this weekend to share with you all. I sewed today! It was my first project in the new sewing room, my first project using my ruffler foot, and the first project of the year (started and finished on the first day of the year, naturally). Don't get too excited. I made a ginormous bum pad! For over a year now, every time I've needed a large bum pad, I've sewn together my small bum pad and my 18th c petal-shaped bum pad. Then, when I've needed them separately, I've ripped them apart again. I've done this probably at least 3-5 times, so I figured it was time to actually make a ginormous bum pad. I used the two together to make a pattern, and cut it out of pink seersucker I had originally bought for the candy early bustle gown in 2011 or 2012, and never used. I used my ruffler foot to make the self-ruffle along the edge, and the tie is some crazy vintage brown wiith polka dots bias tape I've also had in the stash forever. Luckily, I had batting leftover from the banquette, so I had enough to stuff the whole thing, and made it within a couple hours. First up, I will be stacking it on top of my lobstertail bustle to make enough oomph for the black silk ballgown. I also managed to get completely unpacked! I put all my clothes in my dresser (finally), and unpacked the last of the boxes. Plus I hung a few pictures. I didn't make it out in the garage except for a couple seconds at a time, so no painting happened. I never even left the house! It was a nice day off. Tomorrow, we have to go up to the apt to do the walkthrough and hand in the keys, which means I have to go up there a few hours early, put my old couch on a truck (I really hope the thrift store will take it! ), and make sure the place is clean. Option 1: create two small eyelets in the front and insert a drawstring to cinch in the neckline, which I don't think was period, and would ruin the nice smooth look I tried so hard to create in this project. Option 2: take in the chemise neckline in at least three places, which might create a little bulk. It wouldn't make the neckline so pristine like it is now, but at least it would probably look better than gathering. 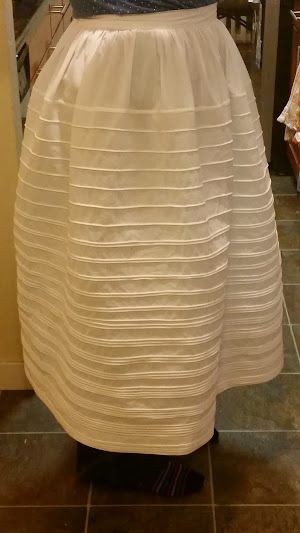 The bustle had to be put on hold for a while, since apparently, Joanns does not sell cotton twill tape! I ordered it online, and it arrived yesterday, so I was finally able to put the ties on the bustle. At this point it's just awaiting a waistband, probably a ruffle, and some sort of finishing for the edges. At the same time, though, I know I really need to dig the mockup for my mom's Edwardian jacket out, and really get going on that, since I think she needs it at the beginning of Oct.
Also my stress level has finally gone down! I found a roommate, she signed the agreement on Tues, and moved most of her stuff in today. I hope everything works out well! Happy Independence Day!! My parents and I are celebrating right now with our usual tradition of watching 1776. And tonight we're going to go to Lake Union and watch fireworks! I hope everyone else is having a great day, too! For those of you attending CosCol, does anyone know when people are planning on wearing Redingotes/Riding Habits? I feel like I keep hearing different times being discussed. We had our first rehearsal in the theatre on Tuesday night, and yesterday, my parents and I explored the Olympic peninsula. In a little antique shop up in Port Townsend, I bought a 1950s (I think?) corset, made by Bon Ton. Can anyone else can better help me date it? It's an underbust, and comes down over the hips and has small elastic panels/gussets under the bust on each side and on each hip. It's boned with steel, and has a corset busk closure in the front. I also bought two pewter-type mugs. Tomorrow, my parents head back to CA, and we have our first tech rehearsal for Gondoliers! And on the sewing front, this not having time to sew thing is driving me crazy with CosCol coming closer and closer! I need a gala gown! 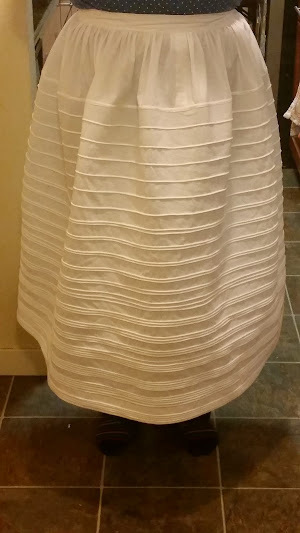 Here is my entry into the latest HSF challenge - the Regency petticoat that I finished a couple weeks ago! Of course, I still haven't taken any better pictures, so you get to suffer through with my ugly mirror pictures from right after I finished it. Fabric: A little less than 2 yd of 90" wide Muslin. Pattern: None. It was really easy to make up based on a couple pictures I saw. Year: Somewhere in the Regency period. Notions: Wide single fold bias tape; wide cotton twill tape for the straps, narrow pre-packaged twill tape for the ties in back. How historically accurate is it? It's completely machine sewn, but the shape seems accurate. Hours to complete: Not too many. If I had had all the materials on hand when I started, I would have finished it in one go. The only time consuming thing was making all the tucks near the hem (there are eight). Total cost: I think the muslin cost me about $7, maybe less. And the notions all added up were maybe $6 total, if that. So at <$13 total, it's not too bad. When I got home tonight, I started on my Regency petticoat. I'm doing the underbust kind, and it's made out of one big 90" wide piece of muslin (I think it was nearly two yards long to begin with, but Joanns does not cut on the grain, so that wasted at least a good 5"). 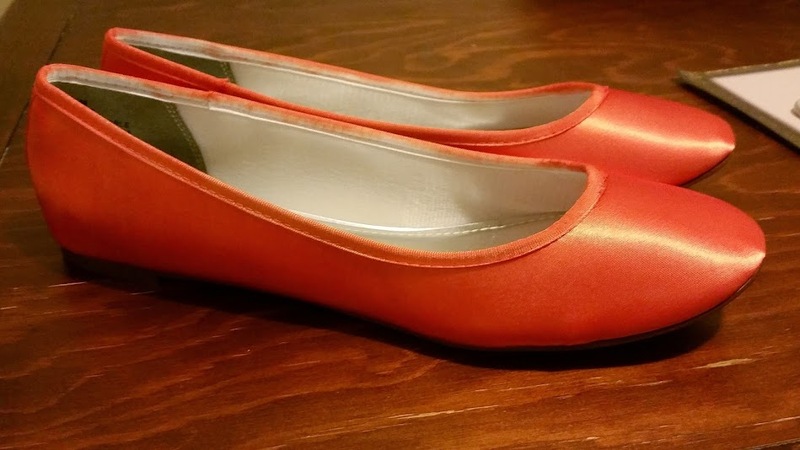 It has one back seam, which is left undone 10" from the top. The bottom has 8 rows of tucks to give it body (and to shorten it to the length I needed). Yes, that's right - I did the math, and I did 20 yds of tucks tonight. Tomorrow, I will gather and bind the top, and add the straps, and then it will be done! Then it's on to the curtain-along caraco.